The other day I was looking to vary up my typical wine drink and was craving a good sangria. So I thought – do I have the ingredients laying around? What goes into a typical sangria? Of course the last ingredient is a favorite of this blog! So now that you know the basic recipe, it’s time to get funky. Here are some other variations of Sangria. With all recipes – mix all ingredients into a pitcher, stir and refrigerate or serve! And I always like to leave you with a bit of history of a drink. Sangria hails from Spain. The traditional base wine is a red Bordeaux from France – or a blend of cabernet sauvignon, cabernet franc and merlot. Now, it’s more common for people to use a Spanish Rioja or other red as a base. 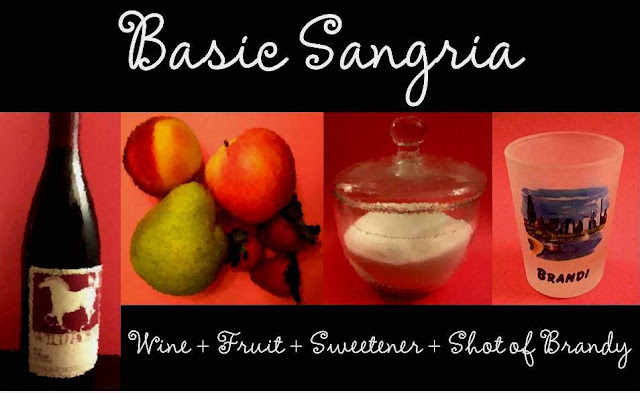 Sangria Blanco is white Sangria and uses a white wine as a base.